I find purple just as easy to wear as blue, it looks great with blue and being my sister's favourite colour probably influenced me too as we shared wardrobes growing up. I have a few purple accessories, and below I'm wearing them with some maxi dresses. I love how maxi dresses can work for multiple seasons, I like to wear as much of my wardrobe as I can year-round. I wore these dresses on a warmer and then a cooler day, showcasing how they can work for different temperatures. This dress is one of those magical pieces in my wardrobe that makes me feel great whenever I wear it - even while heavily pregnant! I've worn the LV bandeau scarf as a belt with it before, and worn the purple bag with it before too. This was the perfect outfit for a family birthday celebration, love everything in this outfit and wouldn't change a thing. Last worn: Louis Vuitton bandeau, pink maxi dress, gold mouse flats, purple mini MAB tote bag. Other ways to wear: Louis Vuitton bandeau as headband, pink maxi dress in winter, gold mouse flats and jeans, purple mini MAB tote bag and maxi skirt. Perfect for pregnancy: bandeau as adjustable belt in third trimester, pink maxi dress at 39 weeks, mouse flats and maternity wrap dress, purple MAB tote and maternity denim shorts. It was a bit cooler when I wore this! And wetter, I wished I'd not worn such a long maxi dress when I stood in a puddle. The struggles of being petite, ha! We had an appointment with a house builder as we were looking at a plot of land. Went out for lunch on the way home. Just like the outfit above, I've worn the bag and dress together before, and did so again as I really like the combination. I liked the purple cardigan with this too. Kept me cosy and added a little more colour to my outfit. It was great for babywearing too, I don't like to wear a lot of zips or buttons if I'm babywearing. I was feeling a little unwell so liked how easy and cosy this was to wear. A jersey maxi dress like this is just as comfortable as pyjamas but looks a lot more presentable! 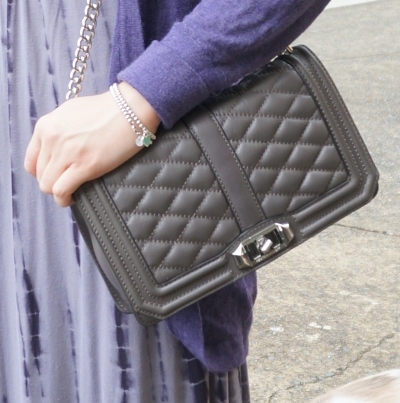 Last worn: purple cocoon cardigan, tie dye maxi dress, silver ballet flats, Rebecca Minkoff quilted Love cross body bag. Other ways to wear: purple cocoon cardigan and jeans, tie dye maxi dress and fringe bag, silver ballet flats and purple jeans, Rebecca Minkoff quilted Love cross body bag and chambray. Perfect for pregnancy: purple cardi in second trimester, tie dye maxi dress at 38 weeks, Rebecca Minkoff Love bag and maternity shorts. Maxi Dresses are a simple, comfortable instant outfit. While they look great in summer, you can wear them in other seasons too. Swap sandals for ballet flats to give your feet a little more warmth, and layer with a cosy cardigan for a chilly day. I agree with purple because it is one of my fave colours too! Love both of the looks! Loving the purple combo! It used to be my favourite colour as a kid - I really need to include more hues in my wardrobe! I much prefer purple over blue, so of course I find it easier to wear as well. How did the patch of land turn out? Hi you look beautiful! I adore your hair as well! I agree very easy and cozy looks...and super chic. Pray you are having a great week! 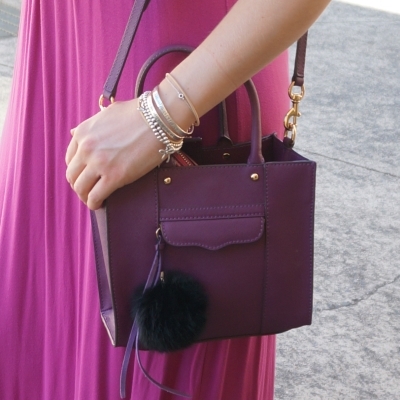 I find purple to be not only a versatile color, but a universally flattering one! LOVE both outfits! Good luck on your land search! Thanks! We are hoping land is easier to find that a house but so far no luck there either haha! You look wonderful in purple, Mica! Well done on breaking yourself out of the colour rut - a nice rich pair of colours like this can really make an outfit. Have an awesome week! I love purple, but I don't have a lot of it in my wardrobe. Looking at your pretty outfits here makes me want to add more. I know I've said it before but I love that cardigan in your second look. Also, the scarf-as-belt in the first look is perfection!! Jersey dresses like the are my favorite- always so comfortable! Purple is a great color on you, especially that fuchsia shade! I LOVE that dress on you, and you should feel great in it, cause it looks great on! I always love a good maxi dress, it's so glamorous! So true how it's versatile for many seasons too! I love the magenta purple dress on you! Maxis are great for spring and summer! http://imyimyimy.blogspot.co.uk/ << drop a comment! Such cute outfits! I love the pop of purple in the first outfit and I adore everything about the second, that dress especially! Thanks for sharing and I hope you have a great rest of the week! I love pieces that make you feel good no matter what. Every woman should have at least one of those. That dress really does look great on you. I love purple too. I don't have a ton of it in my closet though I am not sure why. Both of these maxis look good - and you said it: the best reason to wear something is because we feel glorious in them ! I wish all my clothes were like that... something to aim for ! I shared wardrobes with my sisters growing up too. I love the purple maxi for the fact that purple is my fave color. The blue is lovely as well. Did you find a plot of land? We did find a plot but decided not to go ahead with it, the search continues. I love the maxi dresses, I just wish it was maxi dress weather here but it's currently pouring it down! I love purple! But I really don't wear it enough, love that purple bag in the first photo, it's like my ideal structured bag! Purple dress is amazing. I really like it! The blue one is also very nice. I like how you tied a scarf around the purple dress Mica. I know you love that dress :) I hope you feel better doll. Yes, comfort is so important when we're not feeling our best. But you looked stylish. Purple looks fab on you! You look glowing in it! Using your scarf as a belt is a wonderful idea! I need to try this with my black maxi dress. It's a great way to add color and remix pieces! These are such cute and comfortable looking dresses, and I love how you've styled them! These outfits are so versatile too, which makes them perfect in my book! I love that fuscha dress! The color is perfect for spring and really that tie dye dress is just perfect too! The dresses are fabulous! I love the scarf as a belt, it contrasts beautifully with the gorgeous shade of purple. Thank you for linking up to Fabulous Friday! Love both maxi! The details on the bottom of the purple one makes it super cute! Loving the purple combos! I'm such a maxi dress fan. And cute purse in the first! haha yes I have no suitable footwear for all the land we've seen! Thank you all for your kind comments and compliments. :) I did feel better the next day.